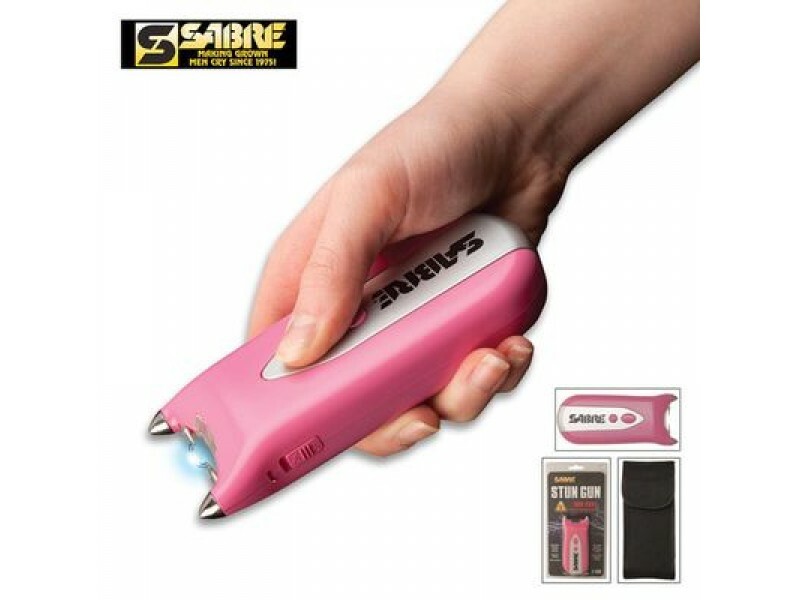 Protect yourself with this pink-powered stun gun! Walk in anywhere, safely and securely. This stun gun delivers 800,000 volts of jolting electricity to any would-be threat. Measuring 5" long and 2" wide, this device is very small and easy to carry. It has a rubber coated ergonomic grip for a very secure hold. This device is powered by 2 CR123A Lithium Ion batteries (not included) and features a safety switch and a red LED light to prevent an accidental discharge. Additionally, this stun gun comes with a LED flashlight and a nylon holster for secure storage. 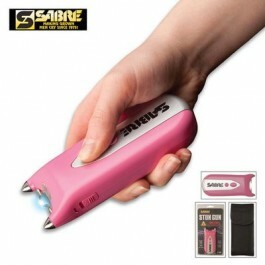 Note: This item cannot ship to WI,PA,RI,MI,NY,NJ,MA,HI Protect yourself with this pink-powered stun gun! Walk in anywhere, safely and securely. This stun gun delivers 800,000 volts of jolting electricity to any would-be threat. Measuring 5" long and 2" wide, this device is very small and easy to carry. It has a rubber coated ergonomic grip for a very secure hold. This device is powered by 2 CR123A Lithium Ion batteries (not included) and features a safety switch and a red LED light to prevent an accidental discharge. Additionally, this stun gun comes with a LED flashlight and a nylon holster for secure storage.